Blue Jays are intelligent and beautiful. With a little patience and some peanuts, you can train them to eat from your hand. Both male and female birds have bright blue feathers and are 9-12 inches in size. They are stunning birds to watch from a distance or up close. While they will make their homes in a variety of different trees, Blue Jays seem to prefer to nest in Oak trees. Blue Jays are a real team when it comes to raising their brood. The female stays on the nest to incubate the eggs while the male brings her food. Blue Jays are not picky eaters. 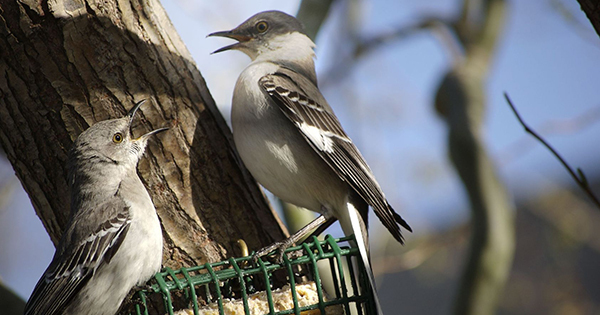 They will eat nuts, seeds, suet and corn; however, a suet mix with seeds and nuts is a great choice too. A flash of blue swoops down from a nearby tree and a large bird lands on your bird seed or peanut feeder with enthusiasm and gusto. The crown and crest of this colorful bird is a stunning blueish grey, and the attitude is unmistakable - it must be a Blue Jay. Beautiful to see: Few songbirds have such strinking blue colors and will visit bird feeders so regularly. Easily recognizable: With their colorful crest and willingness to eat almost anywhere (bird feeders, trees or even on the ground), Blue Jays are easy to spot. Intelligent and inquisitive: Blue Jays are smart and will often dominate a bird feeder (until a woodpecker comes along to challenge them). Learning more about Blue Jays will be an exciting journey into the life of an entertaining backyard bird. Blue Jays have some very interesting eccentricities. They are very vocal and are most likely to sing when they are perched high in a tree. Blue Jays are also known to mimic the call of red-tailed and red-shouldered hawks. 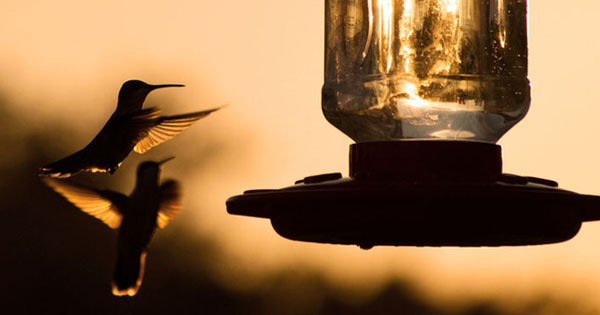 Whether that is to warn other birds of a threat, or simply to scare smaller birds away from a feeder - once you observe them you can decide that for yourself. Blue Jays are notorious for gathering food and then storing it to eat at a later date. They will hide acorns and other nuts (often on your grass or in a flower planter), and then come back to retrieve the food later. Because they like to bury nuts and acorns, Blue Jays are actually credited with helping expand the number of oak trees growing in North America. During breeding season, Blue Jays tend to be very private. They may shy away from areas they normally frequent. One thing that will bring out the aggressive nature of a Blue Jay is if it perceives a threat or predator near its nest. They keep a close watch over the nest. Blue Jays become quite intimidating, often "mobbing" a cat, owl, hawk or even a person that it perceived as a danger to its young. If you find yourself on the receiving end of one of these mob attacks during breeding season, simply walk in another direction. The bird will not actually strike you (at least not on purpose). It simply is protecting its territory and wants to scare you away from its nest. Blue Jays begin breeding in late spring or early summer. Breeding pairs make their nests on a thick branch that is relatively flat, or nestled in the corner of a branch. Blue Jay nests are typically formed into a cup shape and are a little bulky. Made from grass, moss, twigs, leaves, roots and bark, these nests are often held together by mud. It’s just another example of Blue Jay ingenuity. The birds work together to keep their nest safe and their eggs secure. The female does not leave the nest, and the male Blue Jay takes care of the mother bird and eventually their baby birds. After the nestlings hatch, the male provides food for them as well. He’s very busy feeding the extra 4-5 mouths for up to 2 weeks, but eventually the pair both gathers food for the growing brood (as long as the young birds stay near the nest). As the nestlings get bigger, they prepare to fledge (or leave the nest). About three weeks after they are born, the baby birds are ready to fly. Even after they leave the nest, the family stays together for weeks, with parents helping the young birds as they become more independent. The family may even help raise a second brood later in the season. After breeding season ends, Blue Jays will often join larger flocks. Unlike geese and other migratory birds, Blue Jays tend to stay in one area. They don’t tend to migrate south each year like so many other birds do. Since Blue Jays tend to stay year-round in most parts of the country, many beginning birders want to get ideas on how to attract them. 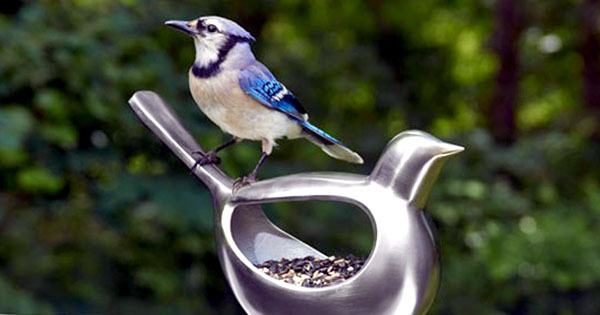 Here are the food and bird feeders that attract Blue Jays. Nut Bird Feeders. 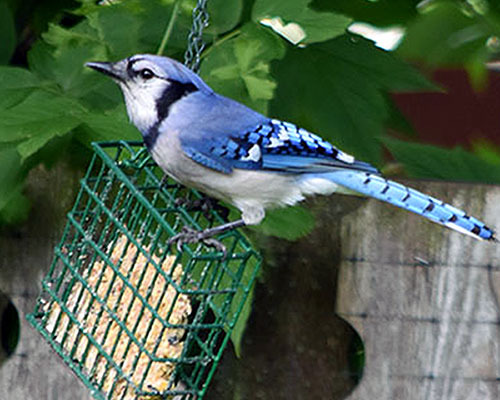 Peanuts are a favorite food of Blue Jays. If you leave the shell on, you’ll have the added entertainment of watching them crack open the shells. A fun fact: a Blue Jay will often hold a peanut with its feet and then crack open the shell with its beak. Quite an impressive thing to watch! Sunflower Seed Feeders. While less entertaining than shelled peanuts, sunflower seeds are common in most mixed bird seed and easy to get. Corn. Like squirrels, Blue Jays like to eat corn kernels. You may be surprised to find Blue Jays eating at your squirrel feeders. Suet Feeders. What’s better than peanuts, sunflower seeds or corn? Suet with peanuts, sunflower seeds and corn mixed in! The beef fat usually used to make suet is an added energy boost for these active and feisty birds. As an added benefit, woodpeckers love suet and will often engage is an entertaining competition with Blue Jays for this valuable food source. If you want to attract Blue Jays and not squirrels, make sure you look into a squirrel-proof bird feeder. There are a lot of different styles to choose from. Blue Jays, like all birds, also need water. They will use it to drink, bathe and even splash around in. Imagine the fun of watching these colorful birds getting soaked in a birdbath. Like so many experiences you will have watching Blue Jays, this one is something you have to see for yourself.